A praying mantis. The pair of diggers getting rid of the blot on the landscape – what I have always thought of as architecture reminiscent of Castro’s Cuba. Captured as ‘an exclusive’ for us by David Pisani of Transit, the multimedia project documenting the changes in Valletta during the Renzo Piano project. I won’t miss City Gate. But I do wonder about the next edifice to rise up in this space. Malta’s new parliament. You can see its foundations in the photo below. I feel it’s a shame we can’t have an open square; a precious green lung for Valletta instead. Even with the airiness the parliament is being designed, we won’t have this view of St James Cavalier, standing proud watching over Valletta’s entrance. So, catch it while you can, glimpsed over the hoardings. Some 60 or so MPs, admin staff and offices could have been housed in disused, grand spaces like St Elmo. 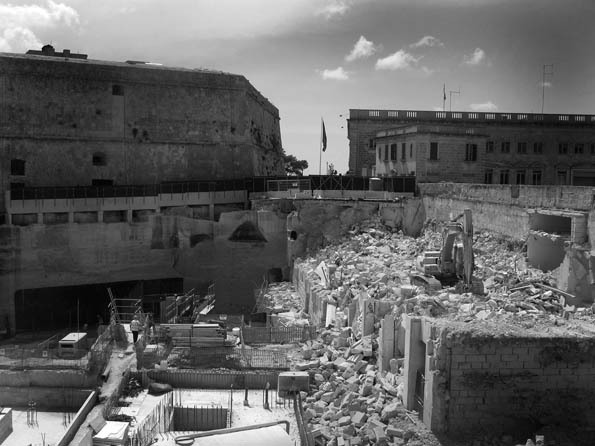 A prime site at Valletta’s entrance will be used now by a minority. Obviously if you’re in power you can’t grant yourself an office where you like. Let’s think more positively about it though; a new parliament perhaps as the symbol of a more modern-thinking and forward-facing Malta? Then again, it might be a face-lift to old agendas. Rising like Phoenix from the ashes. Malta's new parliament foundations. Photos: courtesy, David Pisani, Transit.